Ernst's Economy for you: Mark Zuckerberg and the Law of Unintended Consequences: when you are a (thought) leader, you lead by example... whether you want it or not. How to avoid becoming a propaganda tool? Mark Zuckerberg and the Law of Unintended Consequences: when you are a (thought) leader, you lead by example... whether you want it or not. How to avoid becoming a propaganda tool? The protagonist of the picture is followed by an odd-looking flock of subordinates (and probably bodyguards), who carefully beware of passing their boss during his running practice. “He is the boss and we don’t want to be fired”, is what they seem to think during their cautious tread, following in his footsteps. His spotless, dark-grey (anthracite-ish) T-shirt reveals that this is Mark Zuckerberg: the man that blessed (or punished) the world with his Facebook application and became the youngest self-made billionaire in human history. According to Algemeen Dagblad, the Dutch newspaper that printed this picture, Zuckerberg is involved with his project “A year of running”. And his subordinates? They follow him for as long as the bells of their bank accounts chime... at a cautious distance of the boss. The picture caused quite some emotion in China and no..., not because it was an insult of the Great Helmsman or the Communist Party of President Xi Jinping. No, it caused commotion because neither Zuckerberg nor his assistants wore a face mask, even though the general air pollution and air quality in Beijing are sometimes about as bad as they have ever been measured. As a Western guy, I am often puzzled by the Asian habit to wear a face mask under virtually all circumstances, but not in case of the air pollution in Beijing. The Chinese are puzzled about Mark Zuckerberg not wearing a face mask. The level of air pollution in Beijing is fifteen times higher than considered ‘safe’. Inhabitants of Beijing wonder whether this gesture by Mark Zuckerberg is the umpteenth attempt to please the Chinese authorities, who state that they are slowly winning the fight against air pollution. The Chinese journalist and adamant runner Peng Yuanwen jokingly stated that the lungs of Zuckerberg single-handedly filtered the pollutive particles out of the air of Beijing. “The human vacuum cleaner is obviously better, when American-made...’, he wrote. What also surprised the Chinese was that Zuckerberg was obviously able to post a message on Facebook, where this is impossible for Chinese citizens, as their Facebook accounts are blocked by the government[...]. Normally, the impact of such a picture will blow over in a couple of days, as things normally do. I have little doubt that this particular picture soon will also become nothing more than a small pebble in a large pond. It is a relatively harmless picture that only offends genuine insiders in the Chinese matters and history and leaves most other viewers indifferent, after the hype has gone. Nevertheless, this picture is a clear political lesson for Mark Zuckerberg and other people ‘of good conduct and great power and integrity’: in China and numerous other countries, everything is political. This is especially true for countries with powerful, but vain leaders of questionable repute, who are looking for worldwide influence, recognization and admiration. Picture for illustratory purposes. No copyright infringement intended. The Dutch king, Willem-Alexander, drinking a (harmlessly looking) beer with Russian President Vladimir Putin? 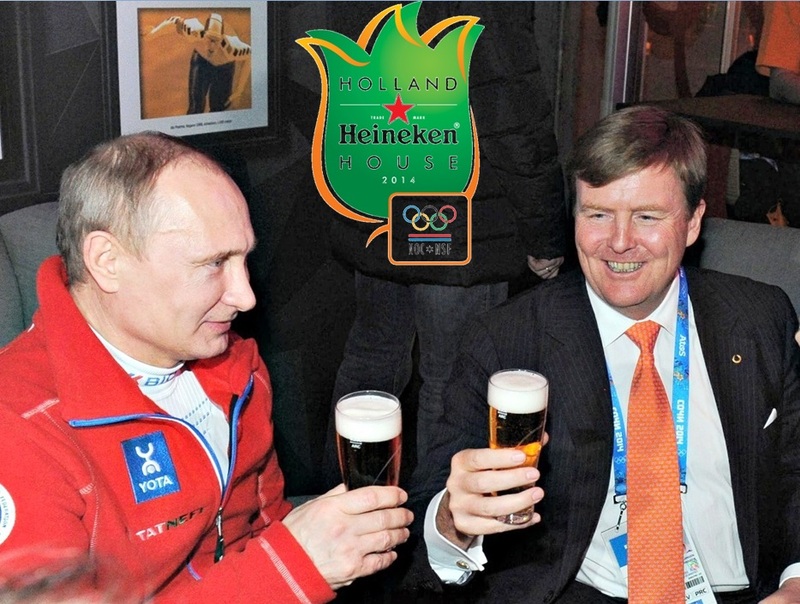 After the Russian occupation of Crimea and the downing of the MH17 airplane, it became a huge political statement that brought substantial harm to the position of the king and the Prime Minister of The Netherlands retrogressively. Two prominent European politicians, Hans van Baalen and Guy Verhofstadt, cheering and addressing the crowd at Maidan Square in Ukraine? Blink twice and there can be a civil war underway with tens of thousands of casualties. European heads of state and government leaders shaking hands (in the past) with people like Moammar al-Qaddafi or Bashar al-Assad?! Be careful with that: most government leaders never saw it coming at the time these two guys fell from grace in their home countries. And then THEIR name was mentioned as one of the contagious, former friends of the now hated old leader and (thus) enemies of the new people in charge. Where political leaders and heads of state play a distinguished and also unavoidable role in keeping up relations with other countries and heads of state – even the not very democratic and sympathetic ones, as a consequence of strategic interests – this is much less so in the case of Mark Zuckerberg, who is 'just' an influential business-man. We can only hope that Zuckerberg is AWARE of the terrible events happening on Tiananmen Square in 1989... and of the fact that a lot of Chinese people CAN’T use his tool Facebook, due to the current account blocks and other, more opaque boundaries that the ubiquitous Chinese government has raised in order to silence the possible protesters and dissidents within their country. And does Zuckerberg UNDERSTAND that Beijing is one of the most polluted cities in the world, in which many people die well before their time, due to exhaust gas poisoning? And that this very edition of his daily run in Beijing, being executed without-a-face-mask, might look like grotesque, Chinese government propaganda on behalf of president Xi Jinping?! Social media, like Facebook, Twitter, Blogger and Instagram have interconnected the world in a way still deemed impossible in the Nineties of last Century. They, however, have also brought forward a generation of thought leaders (i.e. the founders and chairmen and -women of these companies), who have far more influence through their words and actions than they might understand themselves. When these thought leaders use their influence for benevolent causes and positive political influence, this is fantastic and it can work wonders. When they become the subjects of propaganda from questionable leaders and countries, on the other hand, they can damage everything for which they stood initially. So please, Mark Zuckerberg, feel free to run in China, but don’t do it on Tiananmen Square anymore! And when you realize that people actually die from the levels of air pollution in Beijing? Wear a face mask; just to be on the safe side of life.